Fry's Electronics just had a the Samsung LN46A550 (46-in. LCD 1080p HDTV) for $400 off. We've been using my in-laws' television for the last few years and because of their upcoming move, I've been keeping an eye on the television market. I was planning on purchasing the Vizio VO47LF from Costco for $1199, but when the Samsung TV came up at $1299, I decided to take a look at it. Shortly after running a few tests and comparing specs, I purchased the Samsung and took it home. Here's my rundown of the Samsung LN46A550 HDTV. I use an HD DVR (the one Comcast supplies) as my primary means of watching television. I also pretty much only watch HD content. In addition, I have a Playstation 3, DVD (a cheap one that plays just about everything including DVDs that my PS3 doesn't seem to want to play), and a computer that I want hooked up. I used to have a VCR and a second DVR hooked up to the previous television, but haven't used them in so long that I don't think I'll hook it up. For audio, I connect everything through a Dolby Digital and DTS enabled surround sound receiver. Last Wednesday, I swung by Costco to return a defective LCD monitor. After buying another monitor (to replace the one returned), I decided to eat lunch there (how can you turn down a Polish sausage with 20 oz. soda for $1.50?). The dining experience was fairly typical of any Costco lunch (except for the fact that this particular Costco's dining/picnic area was inside the building). You collect your food, load it up with the condiments that you like (it's deli mustard, ketchup, a little relish, onions, and just a bit of crushed red pepper for some extra kick), sit on a plastic picnic bench, and eat next to a bunch of random people. It's hard in these conditions not to overhear conversations or notice badges (most companies in the San Francisco Bay Area have their employees wear badges for security - but this also means that when they are not in their company, you pretty much see each person's name and company). Usually, I'd think nothing of it, but since Tina and I have made our decision to leave the Bay Area in the next couple years, I've been paying a little more attention to some of things that might not happen in other areas of the country. While eating my sausage, I noticed several conversations ranging from an in-depth explanation of potential next generation network security technology that could be picked up by Cisco, the latest hiccup involving some South Korean game animation company and some new Electronic Art's video game, and a harsh critique of both Intel and AMD (which I internally disagreed with). A glance around revealed a mix of people - mothers with three kids, a Hispanic woman telling two Asian kids not to make a mess and eat slower, the older gentleman next to me reading a book he just bought while eating his pizza, and the rest (about 14 or so men) were employees of local high tech companies ranging from those with names that I recognized to ones that I did not. 10 years ago, when I started working in Silicon Valley, this was the scene at Tung Kee Noodle House (an extremely low cost chain of Vietnamese noodle shops that have since split up and broken into various noodle companies). Tung Kee was a place where you could get a bowl of noodle soup for about $3 (a little more now), see other people in the tech industry dining next to you and listen to random conversations about the direction of semiconductors, the hottest stock performers, and even job interviews. Maybe Costco is the new cheap business lunch spot. What I want to know is what a Costco lunch is like in your city? I just built a new computer for Tina to use at home and decided to migrate her from Windows XP to a Vista Home Premium (mainly because I like to have a lot of OS's around, but also so she could get familiar with Vista as an OS). Naturally, I wanted to migrate her Firefox setup from the Windows XP laptop to the new Windows Vista system. It wasn't entirely straightforward, but it was by no means difficult. Here's how I copied her bookmarks, stored passwords, history, and other info stored in her Firefox profile from XP to Vista. On the Vista machine, I installed Firefox 2 (not entirely sure about Firefox 3). I then ran Firefox on the Vista machine logged in as my wife (so Firefox would create the profile directories) and then closed Firefox. I copied the contents of the folder C:\Documents and Settings\<username>\Application Data\Mozilla\Firefox\Profiles\<only directory of indeterminate name> from the XP machine to the C:\Users\<username>\AppData\Roaming\Mozilla\Firefox\Profiles\<some random characters>.default folder on the Vista machine. I then relaunched Firefox and everything was successfully migrated. My CEO at Fanpop, Dave, clued me in on this photoblog: Visions of China from Newsweek. The photos are outstanding, but what really captures my attention are the stories that the photographers tell. One entry in particular captured my attention: Trying to Break out of the Olympic "Bubble" by Vincent Laforet. He tells the story of one day beginning with using China's bureaucracy against itself so he could spend 30 minutes capturing an overhead shot of table tennis. A couple weeks ago I had to head back up to San Francisco to do some work in our data center. After I was done, I took my wife to a Thai restaurant that Dave Lu introduced me to: Manora's Thai Cuisine. The food there is excellent AND reasonably priced (around $10 a dish). 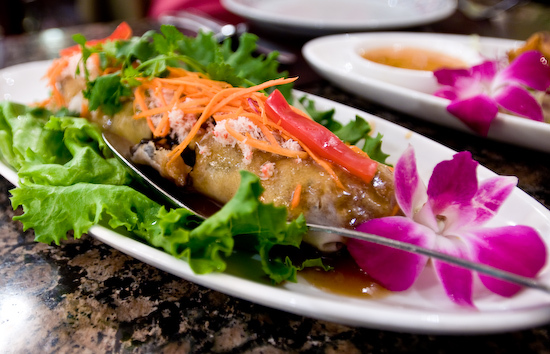 Por-Pia-Sod (rice paper rolls stuffed with crab, shrimp, pork sausage, pork, cucumber and mushroom, topped with sweet and sour tamarind sauce). Highly Recommended.